So Fresh Saturdays Continues….Save the Date – July 27th at Hamilton Park!! | R.A.G.E. Save the Date because our next stop for the Englewood Park Tour/So Fresh Saturdays series will be held at Hamilton Park located at 513 W. 72nd St. (Right off 72nd & Normal)! This is a community driven edutainment series that will showcase various artistic expressions and educational workshops that will focused on youth, entrepreneurship, hip hop, media, social networks, community activism, and culturally relevant history using music, film, and art! Performances from local artists such as T-Y Green, L.Y.R.I.C., J – Real Precise and more!!! 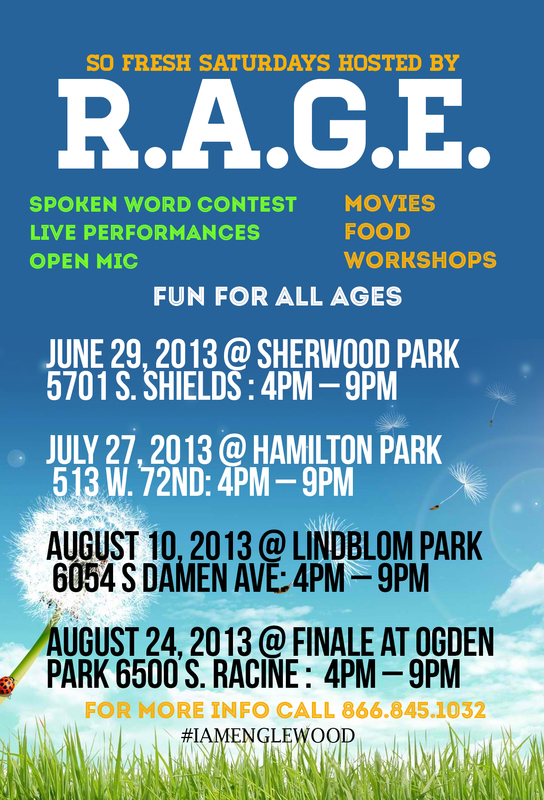 Free food, raffles, live music…Bring the whole family to these fun-filled peaceful events in Englewood! If you are interested in performing, conducting a workshop, setting up a resource table or volunteering contact us at 866-845-1032 or email us at joinrage@gmail.com! Could someone PLEASE contact me so my Organization can help out w/this event?